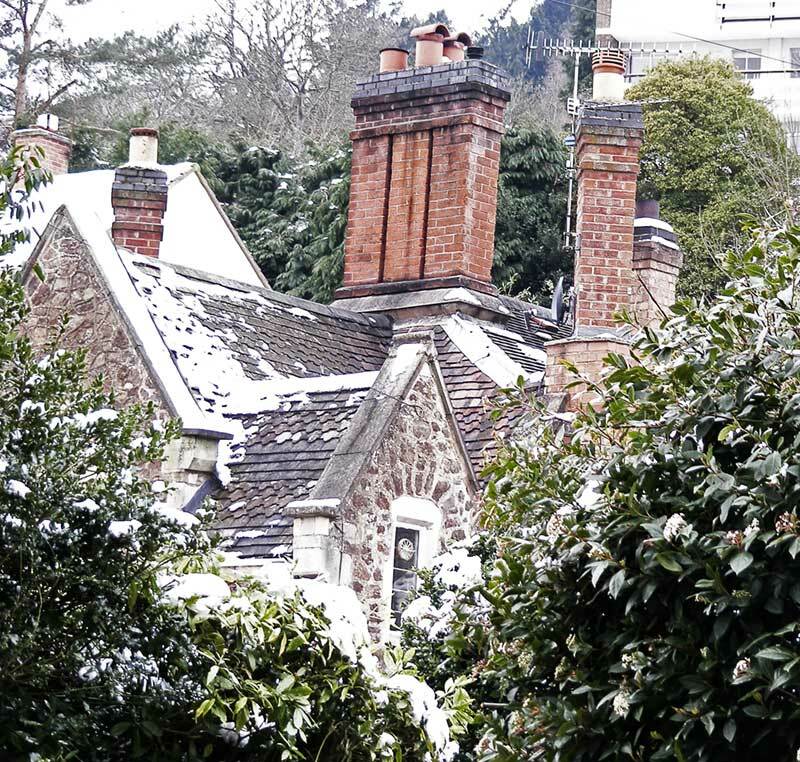 This self-guided walk around the town of Great Malvern was inspired by my Victorian era true crime book, The Water Doctor’s Daughters (Published by Robert Hale). Fortunately, most of the buildings and places of interest relating to the story are still in existence, making for a fascinating tour. Enjoy! 1. ST MARY’S PRIORY CHURCH, Church Street, Malvern. John Rashdall, maternal uncle to the Marsden children, was vicar here between 1850-1856. It was the Rev. 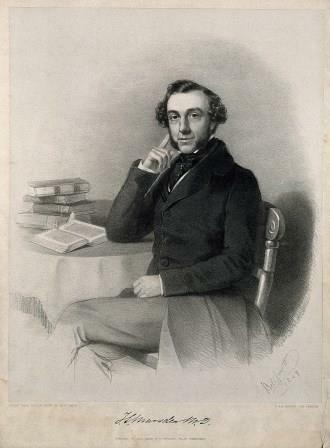 Rashdall who travelled to Paris in 1852 when rumours arose that his nieces were being abused by their governess, Mlle Doudet. The Ambulatory – There is a plaque to the memory of the much loved Rev. John Rashdall here. The Church Tower – The battlements were restored during Rashdall’s incumbency. The bells were rung in welcome when the surviving Marsden girls returned to Malvern after the Paris trials in 1855. The Porch – Attached to the wall is the clapper of one of those old bells that rang out. The Churchyard – In the row of graves closest to the church is that of Lucy Marsden, the water-doctor’s first wife, who died in 1847 during childbirth. She shares the grave with her oldest child Lucy, who died in September 1853 after returning from Paris . Nearby lies Annie Darwin, one time playmate of the Marsden siblings. 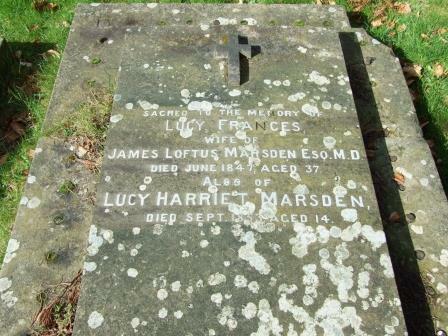 Lucy Marsden’s grave, Priory Churchyard, Great Malvern. 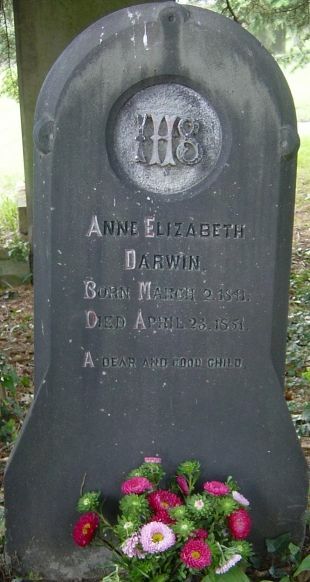 Grave of Annie Darwin, playmate of Lucy and her siblings. 2. MALVERN POST OFFICE– Site of the old Priory Vicarage. It was here the young Marsdens met the poet Alfred Tennyson, their Uncle John Rashdall’s life-long friend. During his stay here in the spring of 1851, Tennyson’s pregnant wife was treated by Dr Marsden. Meanwhile, Tennyson was prevailed upon to mesmerize one of the Dr’s patients, Mary Campbell. Mary married Dr Marsden in December 1852, while the five Marsden girls were in Paris. 3. 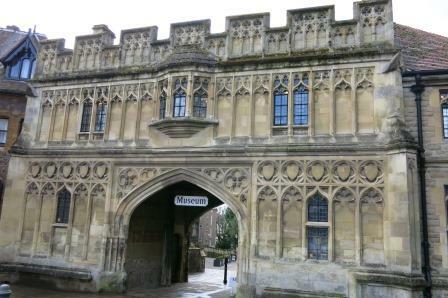 MALVERN MUSEUM OF LOCAL HISTORY – housed in the beautiful old Priory Gatehouse. Open daily 10-30 to 17.00 from March 25 until October 31 (closed Wednesdays). There is a wonderful exhibition on the water-cure here. UPDATE – The museum staff have now included a ‘story-board’ on Dr Marsden, and stock copies of The Water Doctor’s Daughters. The beautiful home of Malvern Museum. 4. ABBOTSFIELD – 14 Abbey Road. Home of the Marsden family from 1853 until 1875, when Dr Marsden retired to London. Young Lucy died here after returning from Paris. The circumstances of her death were the subject of conflicting testimony when governess Doudet was tried in Paris in 1855. 5. ELMSDALE – 53 Abbey Road. Built circa 1852 as additional accommodation for Dr Marsden’s patients. It is an indication of the grandeur of the now demolished Hardwicke House. 6. HARDWICKE HOUSE APARTMENTS – 55 Abbey Road – located on the site of Dr Marsden’s extensive water-cure clinic. The original Hardwicke House was built circa 1851 on a five acre site. 8. TUDOR HOUSE – Dr James Gully’s grand treatment centre, before he retired to London. 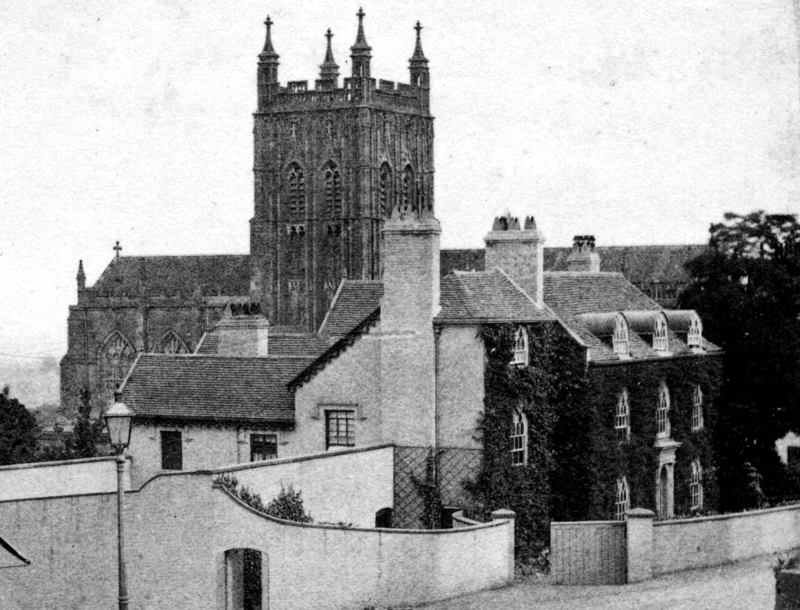 Dr Marsden arrived in Malvern in 1846 as Gully’s partner. Gully’s affair with his patient Florence Ricardo (later Bravo} created a huge scandal in 1876 when Charles Bravo was poisoned in Balham, South London. Coincidently, Dr Marsden was also involved in an affair with local girl Sabina Welch when he & his family moved to London in 1875. Sabina followed Dr Marsden, who set her up as a boarding house keeper in Brixton Hill. Indirectly, all these events played a part in the suspicious death by of a third Marsden daughter in 1877. Plan A. – FOR THE ENERGETIC. From Wells Road between Rose Bank Gardens and Mount Pleasant Hotel skip up the 99 steps. (note the lovely old gas streetlamp as you get near the top…an excuse to catch your breath!) Cross over the road and take the winding, narrow road up the hill. Plan B. – Avoiding the steps. Walk up St Ann’s Road (note the Malvern Book Co-operative located at No. 2 Ann’s Road. You can stop for coffee and home-made cake here, and buy a copy of The Water Doctor’s Daughters!) Pass the Red Lion pub at No. 4 and a few metres further on turn left. Follow the road southwards and after approx.. 100 metres take the narrow, winding road up the hill. 10. FOLEY ARMS HOTEL – 14 Worcester Road. Where many of the wealthy water-cure clients stayed in Victorian times.. In the foyer is the portrait of Emily Foley, Malvern’s Lady of the Manor who approved the Rev. Rashdall’s appointment as vicar of the Priory Church. Hanging in the lounge is the picture of Dr Marsden’s treatment complex, Hardwicke House. In the main bar there are numerous cartoons of patients taking the water-cure. The Water Doctor’s Daughter was launched here in the Morgan Bar on Saturday, March 23 during a weekend of incredible and unseasonable snow! 11. MONTREAL HOUSE – 44 Worcester Road. This property is where Charles Darwin stayed in the spring of 1851, when his 10 year old daughter Annie was being treated by Dr Gully. Annie died here on April 23. 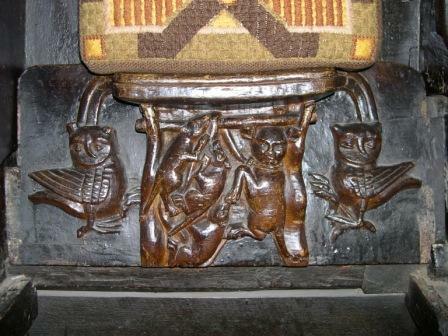 She and her siblings had become friendly with the Marsden children in 1849, when the whole Darwin household spent several months in Malvern while Charles Darwin was undergoing the water-cure. 12. COTSWOLD HOUSE (56 Worcester Road) – Now ABBERLEY HOUSE. 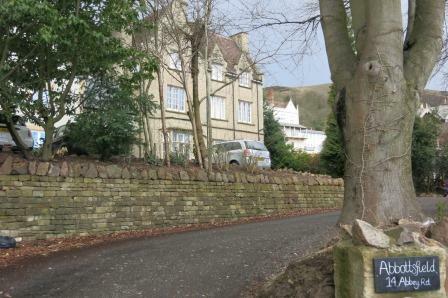 Soon after Dr Marsden arrived in Malvern he moved his family into one half of this property, owned by William Candler. Three unmarried Candler sisters lived in the other half. The two families were initially very close, but apparently fell out around 1853. The Candlers testified against Dr Marsden & his daughters at governess Celestine Doudet’s Paris trial in 1855. The photo below is from a 1960s French documentary on the case. 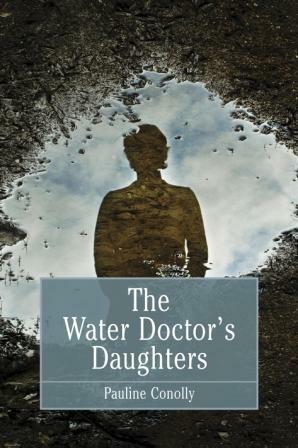 THE WATER DOCTOR’S DAUGHTERS IS NOW ALSO AVAILABLE AS AN EBOOK.